Site constraints and design challenges are the norm with new vacation homes. Sometimes this has to do with the location (deep woods, mountains, coastal areas, etc. ), but local regulations can also have an impact. Take, for instance, the home in Indian Beach, Del., featured below. Community restrictions there virtually prohibit construction in July and August; Echelon Custom Homes met their construction deadline on June 30, just under the wire. Had builder Kevin Babineau ventured outside the footprint of the coastal California home shown above (and featured below), it might have taken him up to four years to obtain the required permit for remodeling. And architect John Everett worked within the limitations of a tight lot on the Long Island Sound to create a cottage with the timeless appeal of older homes in the neighborhood (featured below). Film director Hal Ashby, known for such classics as “Being There” and “Coming Home,” used to chill out at this Malibu, Calif., beach house. Originally built in the late 1930s, the 3,200-square-foot home had undergone minor remodeling over the years. The current owners were planning a kitchen and bath makeover and an exterior facelift, but the project soon took on a life of its own. The program continued to grow through the course of construction, Tohl says. “We ended up redoing all the bathrooms, ceiling treatments, flooring, lighting, mechanical systems, and plumbing.” A small maid’s bedroom was converted into a spa bathroom and changing area. No square footage was added and the floor plan remained much the same, but the exterior received some serious tweaks. Rooflines were simplified and stone wainscoting was introduced around the house and detached garage to tie the buildings together. With a home of this vintage, structural problems were bound to surface. After Malibu-based builder Kevin Babineau discovered rotting wood behind the walls, he gutted the house and replaced as much of the framing as local codes would allow (no more than 50 percent). Babineau also added seismic panels, upgraded the foundation work, and replaced the existing septic system with a tertiary system that Tohl says is “almost like a mini-sewage plant.” A whole-house automation system allows the clients to remotely control everything from the HVAC system and fireplace to the window coverings and hot tub. But the interior finishes are the real show-stoppers. “Every material used was exquisite,” Babineau says, from the blue granite countertop in the kitchen and the onyx shower enclosure in the master bath to the walnut floors and Venetian plasterwork on the walls. Surrounded by marshland, this 4,447-square-foot vacation home in Indian Beach, Del., commands views of Rehoboth Bay. The Atlantic Ocean is within walking distance. Architect Paul Kiss of Olivieri, Shousky and Kiss in Collingswood, N.J., designed a C-shaped plan that embraces vistas of the salt marsh, the bay, and a yacht basin in the distance. Kiss placed the main entrance at the center of the house, with living areas on either side. A staircase leads visitors up to the first-floor breezeway, where “the view just expands out before you.” The entry foyer, to the left, is comparatively modest, he says. Kiss says the clients wanted a shingle-style home with a beach cottage feel, “comfortable and casual.” The design spreads living spaces out over three levels. On the ground floor, the laundry room links the two-car garage to two bedrooms, a full bath, and an outdoor shower. The first floor includes the master suite and two additional bedroom suites, connected by the breezeway to a storage area. On the second floor, the sunroom provides a “bridge” between the game room/bar area and the kitchen, great room, and dining room. All of these areas wrap around outdoor space that is made for entertaining with its multi-level decks, covered porch, swimming pool, hot tub, and wet bar. Adler says the client wanted the home to have a light, airy feel “without going over the top with the beach theme.” White trim in the kitchen and living room and white cabinetry throughout the home reflect the coastal setting. Deep blue glass tiles provide contrast in the kitchen, and the walls are painted a soft sea green. The master bath is a dramatic combination of black cabinets and black and white carrera marble. Groton Long Point, Conn., on the shores of the Long Island Sound, is a popular location for second homes, and there are few lots available. A couple with three children, one of whom has physical limitations, found one of those rare properties and approached architect John Everett about designing their home. 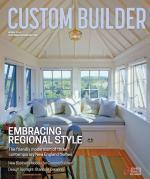 “They wanted it to look like a classic New England cottage and be accessible for their son, who uses a wheelchair,” says Everett, of New England Design, Mansfield, Conn. The lot was small — 60 x 100 feet — and “the amount of coverage that zoning allowed limited the size of the house,” says Everett. “We wanted it to be appropriately scaled to the neighborhood and also complement the house next door, which has a similar cottage design.” Because the lot has 6-foot side yards and is right on the setback line, about 15 feet from the neighboring house, Everett had to position the windows to maximize natural light, frame views, and maintain privacy. The 2,300-square-foot, two-story home is sited with the narrower gable end facing the water. Everett achieved the desired cottage look with trellises, flower boxes, bead-board soffits and eaves, exposed rafter tails, fly rafters, outriggers, shed dormers, a stone chimney, and a covered porch. That theme is carried through to the interior with such finishes as cherry flooring made of random-width planks, exposed beams wrapped in cherry, bead-board paneling, and a stone fireplace with a cherry mantel. Comments on: "3 vacation homes with style and pizzazz"